Bring your fishing pole! Brook trout glide thru Alarka Creek. From the fire pit make yummy s'mores and count the shooting stars. Let the games begin! With a foosball table, a ping pong table, Wi-Fi, and outdoor games, this retreat is sure to delight. You’ll find a Fisherman’s Heaven at Paradise Valley Lodge! 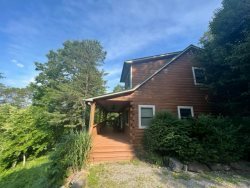 With trout fishing just steps from the cabin, you and your family will find spacious Paradise Valley Lodge to be the perfect fit that to return to year after year. With 3 bedrooms and 2 baths all on the main floor, Paradise Valley Lodge sleeps 6 people. The first bedroom has a King-size bed and a private bath with a jetted tub and shower combination. A second bedroom has a queen-size bed. A third bedroom has two twin-size beds.The second bathroom has a tub and shower combination. A vacation at Paradise Valley is the perfect choice! Roomy enough to relax indoors watching TV, enjoying the gas log stove in the living room, or enjoying the game room downstairs. The game room downstairs features both a ping pong table and a foosball table. The Billiards Room has a 7 foot pool table. Paradise Valley is also a great choice if you want to spend time outdoors with plenty of room for badminton, croquet, soccer and more. Enjoy the creek year-round from the covered deck. Grill fish that you caught yourself -- all you need is a fishing license (see the link to get one online off our local area guide). You’ll love picnics by the creek and roasting marshmallows at the fire pit. The team at GSCR was great, I really appreciate the fact that they sent several emails to make sure that I had the information I needed to locate the property and gain access upon my arrival. I also appreciate that they contacted me via phone on the day we arrived to make sure we had no issues checking in. We really loved the cabin and the views and we are so glad to be able to come here. We took our grandchildren on this vacation. They have never been out of the state of Florida, seeing the trees (that weren't Palms) the mountains were a thrilled to us as it was for them. They loved the steam, the game room, videos etc. The property was clean, neat and they respected that in their stay also. They had a great time with the fire pit, making smoores etc. They want to return also. We loved the cabin. We hope to make a return trip next year. We want to bring more of our family members. We brought 4 of our grand kids and they loved it and loved playing in the water. This is our 4th year here at Paradise Valley Lodge. We love it here. Hope to continue to get to make memories year after year. The kids love it and can't wait to make it back each year. It is our 37th year of coming to Bryson City. See you next year. We stayed here for the week of the 4th of July. The cabin was beautiful and peaceful! We all loved playing in the stream and listening to the lull of the river. The lodge was clean and decorated nicely. We loved the cabin and the town. We will be back. Very friendly and easy to talk to. Amazing from start to finish! We hated to leave. It seemed to have the best prices and locations for what we were planning to do on vacation. I think we had everything we needed at all times. We had a great time in the game room downstairs and the bedrooms were beautiful. We also loved the big open kitchen and my personal favorite was the fire pit out by the creek!! We had a great week. Love the cabin and the yard. The kids didn't want to leave. We will be back next year. This is our 3rd year staying here. Great Time yet again. The cabin is in a perfect location. Hope to be back next year. Thank you for sharing your home, this is over 40 years my family has been coming here. This has been on of the best places for our family to stay. Our family really enjoyed our stay. Very clean and plenty of things to do in the area. This will be a regular fall get away!